Timmermans was speaking at a presser on the island of Kos, where asylum seekers arrive from the Turkish coast, 5 kilometres away. That is where the drama unfolded when 3-year-old Aylan Kurdi, his 5-year-old brother, and his mother drowned on 2 September. Aylan’s picture, face down, on the beach in Bodrum, shattered consciences across Europe. 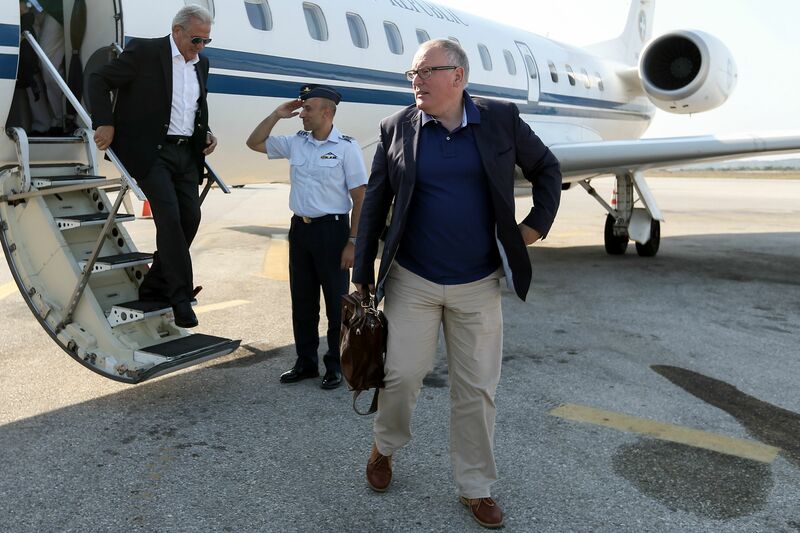 Timmermans and Migration and Home Affairs Commissioner Dimitris Avramopoulos are in Greece to discuss support measures to the country, as well as to agree on establishing a so-called “hotspot” reception centre for migrants in Piraeus. “Let’s be very straightforward and honest with you. The refugee crisis is here to stay with us, for a long time. […] We will all have to face the consequences of the refugee crisis – every single European, 500 million of us,” Timmermans said. The Commission official made it clear that the EU was making a clear distinction between asylum seekers, especially from Syria, who flee their countries to save their lives, and economic immigrants who simply seek better opportunities in Europe. He added that further measures need to be taken to ensure the swift return of migrants who are not eligible for asylum. But he added that Europe also needed to meet its moral and legal obligations to give safe refuge to people fleeing war and persecution. “If we forget this, we forget who we are, and we leave Europe to the xenophobes, the extremists, who will destroy it,” he said. Timmermans acknowledged that the EU had the moral responsibility to receive migrants, as it has been unable, together with the other world’s major players, to find a solution to the Syrian civil war. “The world is a bad place, and not far away. Europe is a safe haven. Europe is a beacon to people all over the world who fear persecution. Let’s be proud of the fact that they want to come to Europe, that our continent is so attractive,” the Commission First Vice-President added. Avramopoulos said that in the coming days, Greece would receive the first €33 million installment of some €474 million in EU funding being given to the country to help tackle the influx until 2020. ” Illegal Migrant ” crisis in Europe is going to be with us for a long time , means Europe as we know and have loved it is finished , forever destroyed to save people who hate us , will never leave , who will never integrate and assimilate in European society . This crisis far from creating EU solidarity , will likely bring about the end of the EU . Europe is better as individual sovereign states , without an EU commission or parliament . Exactly the NGO’s and special interest groups are behind this crisis and the politically correct coward don’t dare to take a stand because they are supposedly civilized. Timmermans his Party needs the underclass continue the agenda of wreaking havoc on society and innocent human life. This unelected political failure is talking nonsense these are not refugees running from a war zone they are economic migrants looking for free money health care housing and will destabilise the nations of europe further with their meadiaval religious ideations. It won’t be the xenophobes who destroy Europe, because the open border system has already done so. Of course the “refugee” crisis will be there forever. How long will be it before some enterprising people smugglers get more seaworthy boats to safely traverse a mere 5 miles? They will simply charge a higher fee. What sort of parents risk their children’s lives on un-seaworthy craft? Australia saw 1100 people drown the same way and the new government quickly closed its borders. With the influx of more than 50,000 people, the majority being economic refugees, and a population of only 23 million, only half of whom pay taxes to support the health, education, housing and requirements of long-term unemployed border-busters, what would have happened when the taxpayer funded welfare system could no longer be sustained? Look to Europe or the UK to pay the bills? Close your borders Europe. Send aid, but expect that the young, fit men we see running away from their countries to go back and contribute to fixing their problems. Or give them temporary refuge then send them back when it’s safe to do so. If ever Europe needed to wake up to the belief that it’s possible to successfully mix oil and water, it’s now. Frans Timmermans ist eine Schande, nur lassen diese Menschen in die unkontrolliert und ungeprüft puts EU alle ihre Bürger auf dem Spiel. Ein solches Verhalten ist grob fahrlässig. Frans Timmermans is a disgrace just letting these people into the EU uncontrolled and unchecked puts all its citizens at risk. Exactly….typical politically correct talk, because they social democrats (PVDA) needs to underclass to keep their gravy train going. When Pim Fortuyn warned about this….they called him names and turned him into the Dutch Hitler…and yes he was assassinated because of the climate of hatred coming from these cowards…..
Well the fact is the refugee crisis really is here to stay. There was a time when Europe could have pulled up the draw bridge if it’s principles would have allowed it, which never was the case meaning this is the only likely outcome. But there are another two billion people out there living on $1,50 and they will be looking where? Fortunately estimates are that Europe still needs some fifty million worker migrants before 2050 to maintain industrial output so say welcome to multicultural Europe, firmly here to stay. Which will lead me back to one thing: society and the world we live in will change faster and more profoundly then anyone here anticipates. With the massive amount of unemployment which is in no means being addressed by the unelected commission whose regulations have caused it why do we need 50 million more people, if anything we could do with that many emigrating to places that unlike the eussr are blooming. They need an underclass to rescue the welfare state…. This a very typical PVDA talk, it is here to stay because we need these people, the underclass to needs to rescue the welfare state. Refugees to the Netherlands can take advantage everything that the state has to offer but these very same social democrats are violating and trampling the rights of citizens. See what they did to Pim Fortuyn warned about the uncontrolled influx of refugees into the European Union, yes they called him anti-immigrant, racist, fascist, untermensh and of course Dutch Hitler. It is an abomination the Europe is facilitating the mass economic exploitation of people using the social welfare state. Ha so this situation has been created or welcomed by the vast army of EU Lawyers, political and social scientists and politicians (talking heads) to provide these particular cartels with unlimited employment at taxpayers expense. Exactly, taxpayers have no choice, they work and pay into the system all these talking head have enough money to subsidize their pet projects. This has been going on for decades. It is cruel and inhumane what the EU is doing to its on citizens. It seems honest criticism of the EU project is to be met with getting critics jackbooted off the site. Ah the impact of Socialism. This manufactured crisis comes seventy six years after the beginning of WWII, and a defining moment for Europe and the member states of the Union. This is very sinister that needs a deep discussion because there is a lot more that eyes can’t see. Multiculturalism and Cultural Marxism is setting the agenda and when things hit the fan nobody can say this time that wir haben est nich gewust….! I am sorry but Timmermans seems that has lost his mind along with the rest European leadership! The refugee problem of Syria is caused clearly because the Turkish government has officialy changed it’s position towards the refugees. After arming all terrorist groups against Assad and the Kurds and promoting the destruction of Kobani the hometown of little Kurd Alan they have also decided to load tens of thousands of refugees and migrants on floating coffins not on boats and send those people towards Greece! I am sure that the FRONTEX has witnessed how the Turkish coastguard helps the slavetraders send refugees towards Greece! In any case it is a shame that Timmermans does not want to say to US, Russia, Israel, Saudi Arabia, Turkey and Iran all directly inplicated in the Syrian war, what to do, because they say that Europe has an obligation to accept refugees, well how about them who decided to destroy those people’s houses by supporting the Arab darkest winter? According to an AP report the Leftist in Germany accused the US and others from creating this crisis. Timmerman’s talk is typical political correctness and show the lack of spine of some people in the EU. With leadership come courage and there is no trace of that coming from the EU right now…..very sad.